Penthouse B is a modern one-bedroom, one-bathroom home located in The Jefferson, a full-service, eco-friendly new construction condominium. 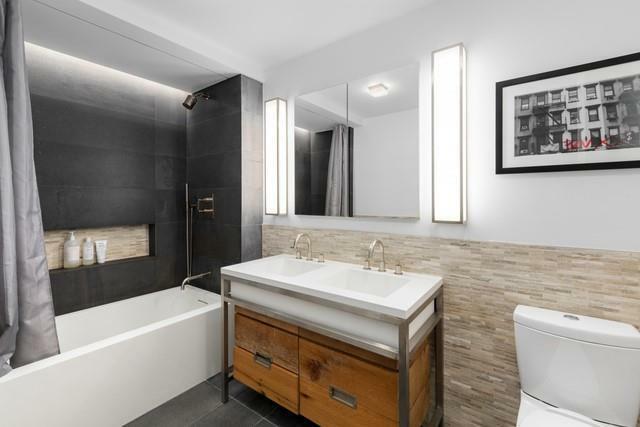 Situated on a serene, tree-lined Village block between Third and Second Avenues, 211 East 13th Street is just moments from Union Square Park. 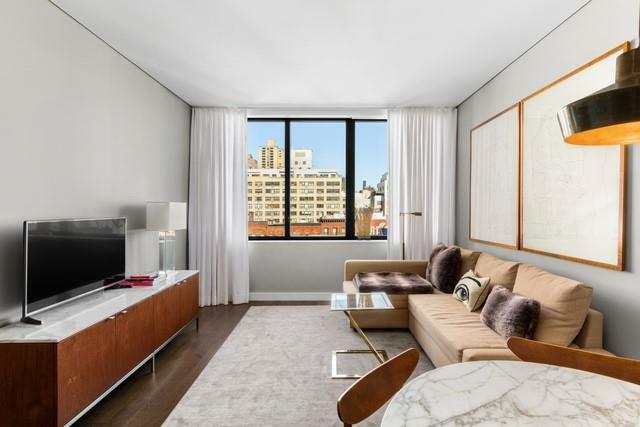 Lightly utilized as a pied-a-terre, PHB is offered in near mint condition as the residence's first resale. Elevated high above the pin-drop-quiet private residential gardens of The Jefferson, PHB clears the surrounding low-rise buildings to showcase open sky and exposures. A gracious foyer flows freely into the living room with flexibility for dining and entertaining areas. Natural light bathes the interior through expansive high-performance double-paned windows, which frame decorative architectural cornices to the north. The open chef's kitchen centers on a large Corian island / breakfast bar. 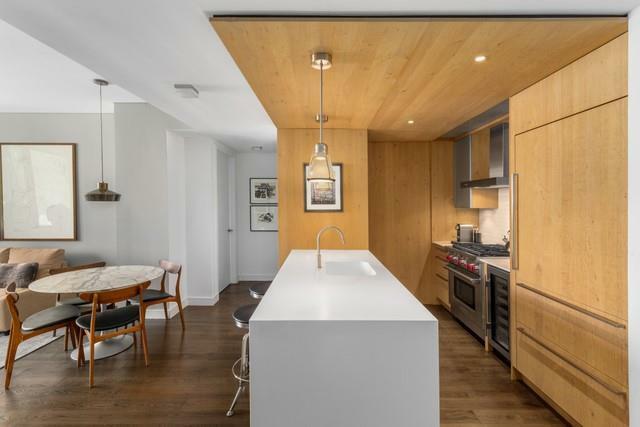 Natural oak paneling on the ceiling and walls defines this space designed by Eggersmann Home Living, a European cabinetry company esteemed for its sustainable practices and materials. The kitchen is equipped with a seamlessly integrated 36" Sub-Zero refrigerator with two freezer drawers, a Wolf gas range and microwave oven, Sub-Zero 26-bottle wine refrigerator, Broan hood and Bosch dishwasher.The master bedroom also faces north and boasts an oversized walk-in closet. Directly across is a sumptuous bathroom outfitted with a radiant heated Basaltina stone floor, honed limestone walls, a double vanity crafted from reclaimed barn wood, GlassCrafters two-door medicine cabinet, and premium fixtures by LeFroy Brooks and Restoration Hardware.Other highlights of PHB include a full-sized Asko washer and dryer, Somfy shade automation system, custom window treatments and lighting, lofty 9'2" ceiling heights, central air conditioning and heating, and wide-plank oak flooring throughout. 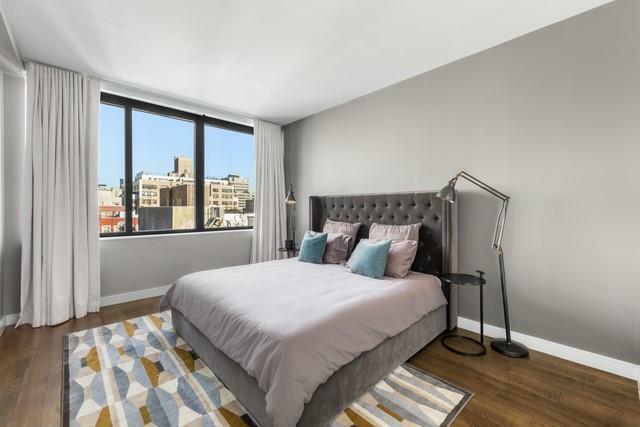 Replete with amenities, the building features a 24/7 doorman and live-in resident manager, state-of-the-art fitness facility, resident lounge and business center. A furnished rooftop landscaped by Town & Gardens with panoramic views is appointed with an outdoor shower, multiple barbecue grills and a pergola.The Jefferson is a luxury condominium conveniently situated at the nexus of Greenwich Village, East Village, Union Square and Gramercy with proximity to some of New York Citys finest restaurants, shopping, markets (Trader Joes and Whole Foods), and parks (Union Square, Stuyvesant Square and Tompkins Square). The building, on the former site of the famous vaudeville era Jefferson Theater, showcases a dramatic design by award-winning BKSK Architects that pays homage to the location's storied past. The building received LEED Gold certification, a rare achievement as a result of its "green" initiatives.